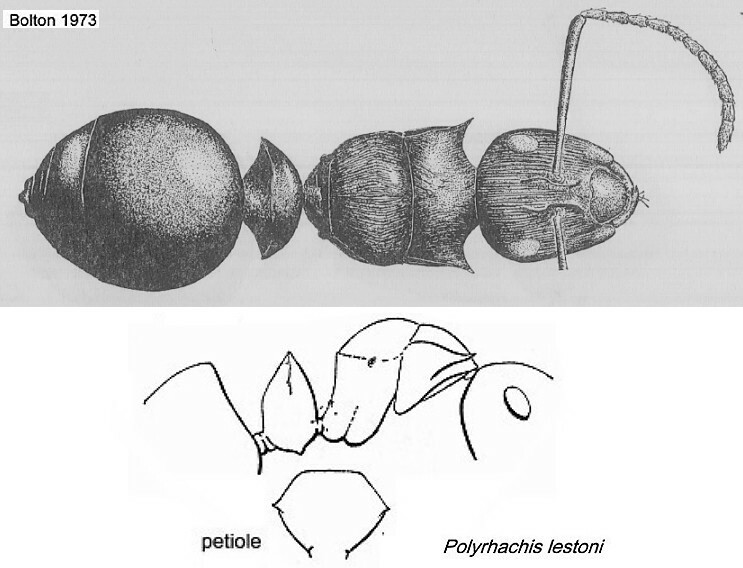 Type location Ghana (Bolton, 1973b: 349, illustrated, full body dorsal view, alitrunk and pedicel profile, anterior petiole); holotype and one other worker from Mt. Atewa (Atewa Forest Reserve), collected by pkd, by D. Leston, 12.vii.1969 - see below; also from Adeiso (P.M. Room, presumably one of his cocoa canopy species, Room, 1971) (Bolton, 1973b) . 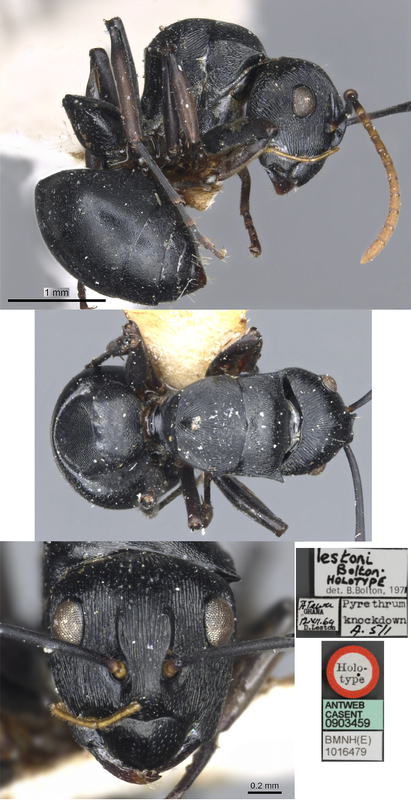 WORKER - TL 5.5-5.7 mm; dorsum of head and gaster with a few erect white hairs, everywhere with a sparse greyish pubescence. Rigato (2016: 27) added "This species was known from Ghana only. Yet, some recently collected material strongly increases its known range. It must be pointed out that the weak transverse ridge separating the propodeal dorsum from declivity may be virtually absent in some specimens. In such cases dorsum and declivity are differently sculptured: the dorsum is longitudinally, posteriorly convergently striolate, the declivity superficially reticulate-punctate. 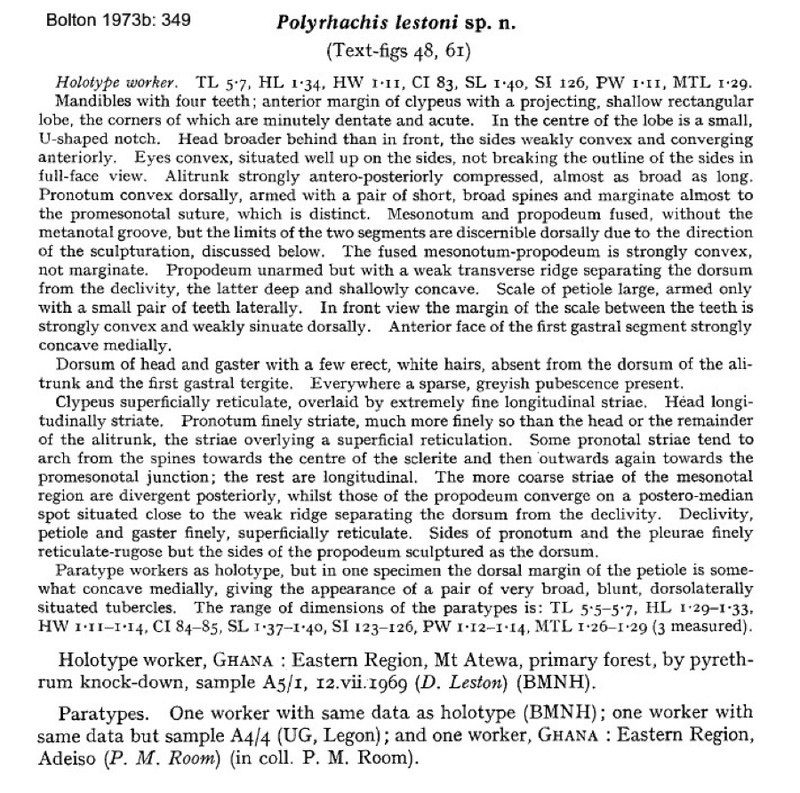 The photomontage is of the holotype worker, collated from http://www.antweb.org/specimen.do?name=casent0903459. The photomontage is of a specimen from Ghana, collated from http://www.antweb.org/specimen.do?name=casent0227539. Curiously not listed by Bolton (1973b: 349). 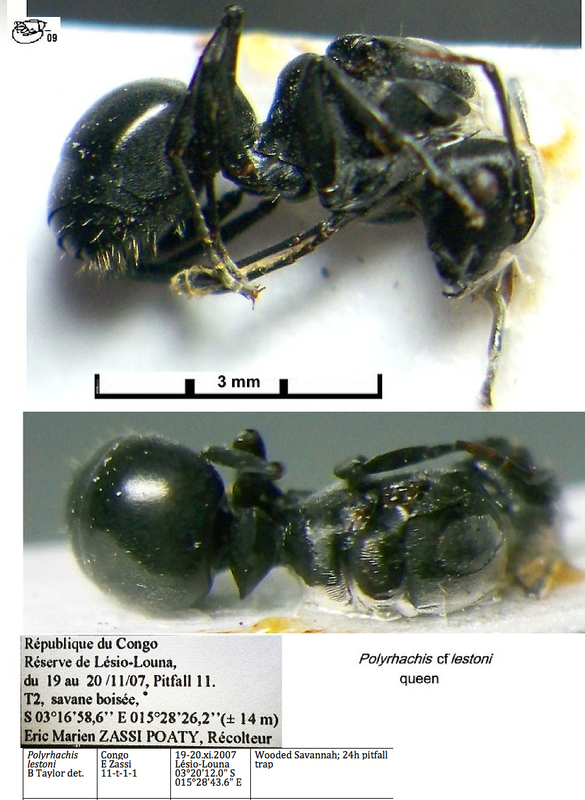 The photomontage is of a queen from Congo, R閟erve de L閟io-Louna; collector Eric Zassi (pitfall trap 11, t 1). The photomontage is of the queen from Congo after remounting. 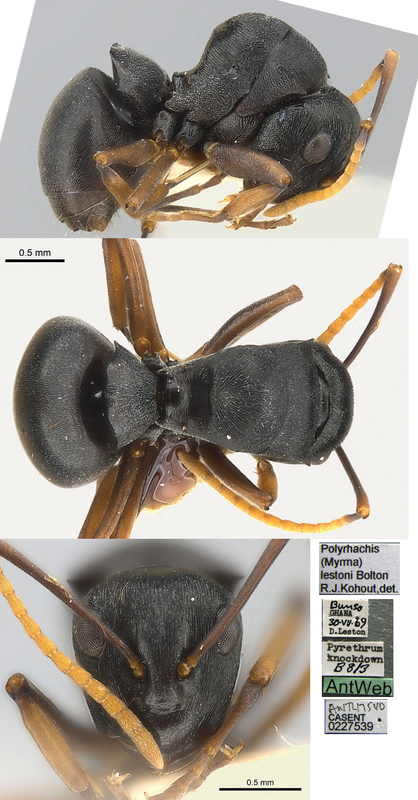 The photomontage is of a specimen from Kenya, compiled from http://www.antweb.org/specimen.do?name=casent0178251. Note: I suspect this is a closely related species rather than the Ghana type. Overall it is below the size range reported by Bolton (1973b) and the scape index is much lower. From the Antweb photos - HL 1.10, HW 1.02, CI 93; SL 1.10 SI 107; PW 1.07. It also differs in a number of ways. For instance the clypeus of the type has projecting shallow rectangular lobe, the corners of which are minutely dentate and acute; it also has a small U-shaped median notch. The clypeus on this is arcuate with a weak median point. The type has more pronounced pronotal spines. The type has a few erect hairs on the dorsum of the head and gaster, this has no such hairs, and has sparse greyish pubescence.